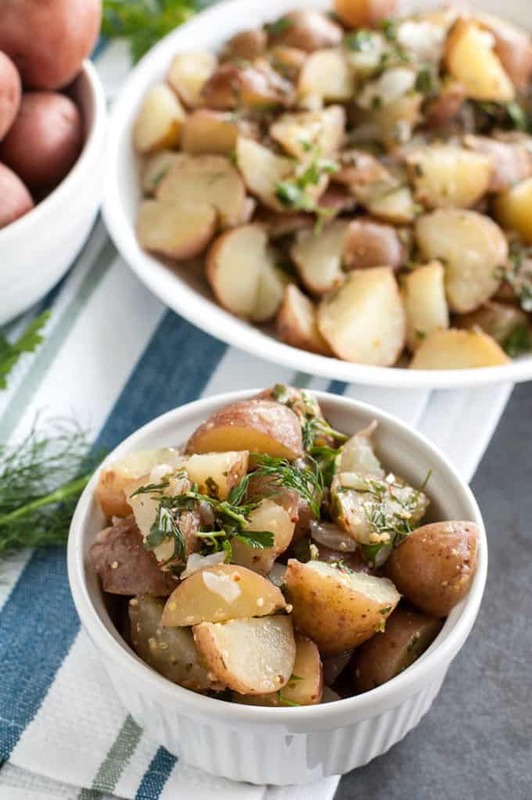 Fresh herbs and potatoes join forces to make this flavorful herb potato salad. Perfect for any gathering, pot-luck or the ultimate side dish. Today I am talking potatoes. Mash, fry, or roast them, there are so many ways to use these tasty root vegetables. Once the weather starts to warm up outside, I especially like using them to make potato salads. 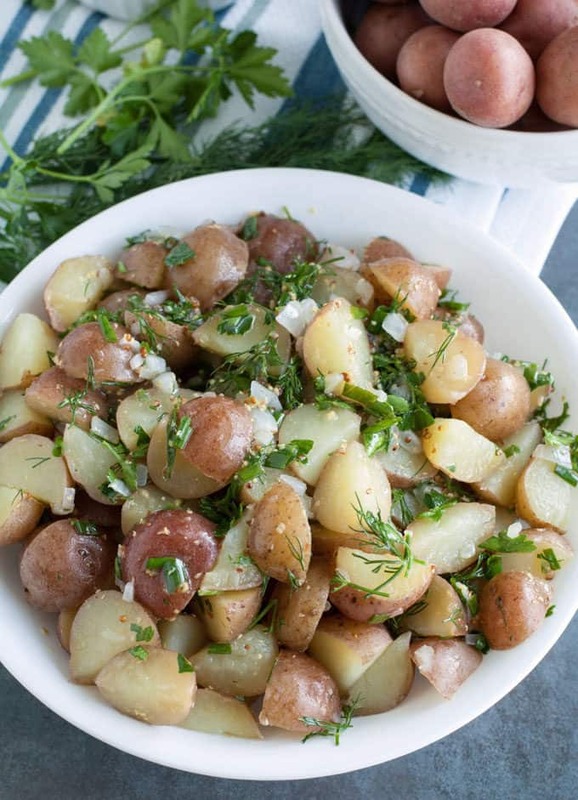 Can’t you just picture going for a picnic on a sunny spring day with fresh herb potato salad in your basket? OK, back to reality. 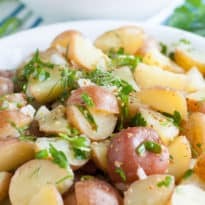 Today, I am sharing a herb potato salad recipe that my mom would make for our family gatherings growing up. It is a vinegar based potato salad made with no mayonnaise and only takes about 20 minutes to prepare. If you are like me and love fresh herbs, you may even grow some at home, this is a wonderful recipe for you. It is filled with fresh dill, chives and parsley. Yum! I really enjoy growing my own herbs at home. My kids have so much fun helping me take care of them. There is something satisfying about using ingredients that you grow. ***Did you know you can freeze fresh herbs? Chop the herbs and then place 1-2 tablespoons of the herbs into an ice cube tray compartment. Add 1 tablespoon of water or olive oil on top of the cut herbs in each ice cube compartment and freeze. Take the frozen herb cubes and place them in a freezer safe bag until ready to use. Back to the potato salad. I like to use small red potatoes for this salad but small gold potatoes would be nice too. Cut them into 3/4 inch chunks and place in a pot full of cold water. Boil for 10 minutes or until the potatoes are fork tender. Drain the potatoes and set them aside to cool for at least 10 minutes. Be careful not to let them cook too long or they will become mushy in the salad. Dice some sweet onions and saute in a skillet until tender. They will get mixed into the dressing. For the dressing, stir together vinegar, parsley, chives, dill, mustard and cooked onions. Pour in the cooked potatoes and toss to coat. Serve immediately or cover and chill if you prefer a cold potato salad. The soft, creamy potatoes, fresh herbs, whole-grain mustard and tangy vinegar makes this one flavorful salad. 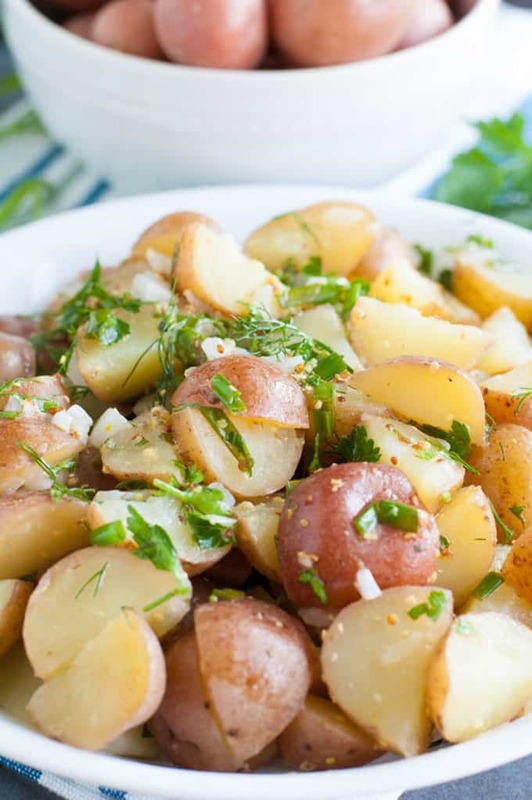 I hope you love this herb potato salad as much as my family. Enjoy! You might also enjoy this Dutch Potato Salad or Cucumber Salad. What is your favourite potato salad recipe? Place potatoes in a medium pot. Add 1 teaspoon salt and cover potatoes with cold water. Bring to water to a boil and cook for 10 minutes or until potatoes are fork tender. Drain the potatoes and cool for at least 10 minutes. Heat 1 tablespoon of olive oil over medium heat in a small skillet. Add onion and saute 5-6 minutes or until tender. In a bowl, mix together vinegar, parsley, chives, dill, mustard, remaining 1 teaspoon of salt and cooked onions. Stir in remaining olive oil. Add in warm potatoes and toss to coat. Serve warm or cover with cling wrap and chill until ready to serve. 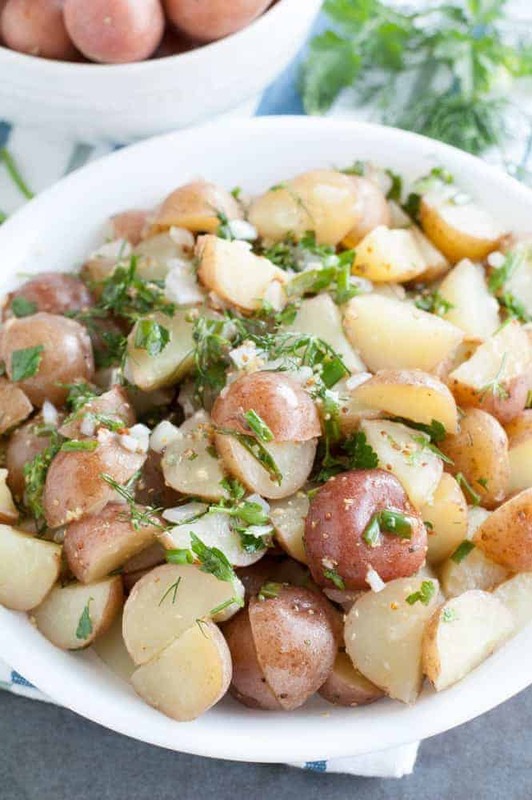 The Herb Potato Salad looks delicious and I want to make it for a gathering that I have this month. It sure looks like a delicious potato salad to try. Different take on a potato salad, I will have to give this one a try. Maybe for a potluck we are going to in a few weeks. I have always used mayonnaise in my potato salad but this recipe would be a nice change. Oh my this looks amazing! I love your tip about freezing herbs in ice cube trays for later use..sweet! This is a perfect recipe without the heaviness of mayonnaise. Thanks for sharing this! This looks and sounds fantastic. Now I know what I’m making with the potatoes that we planted this year. Fresh herbs add so much flavor to this dish. I like that the dressing is vinegar based and good for picnics. Oh my! This looks delicious! And no messy mayo! This sounds delicious. 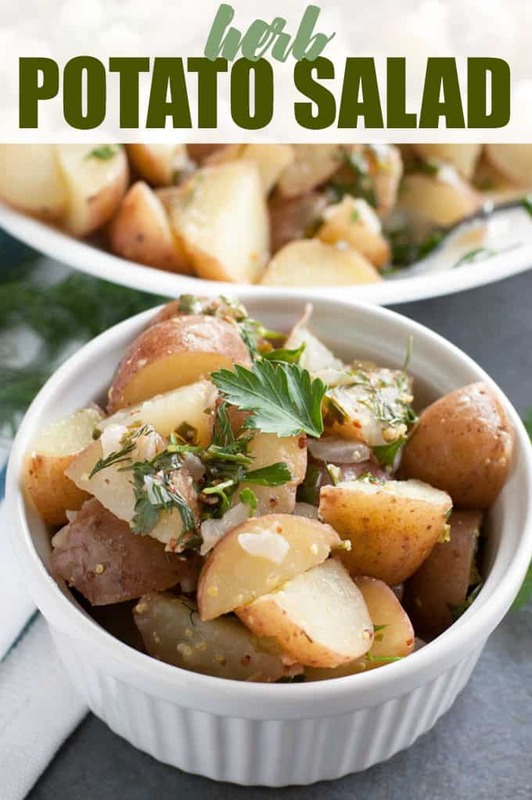 I love potato salad, however I’m not a fan of dill though so I’d just use more parsley and chives instead. This is awesome, I always liked potato salad. Thanks for the recipe Stacie,i’m sure my family will enjoy this ! This looks great. I love potato salad. This looks like an awesome potato salad. Yumm! this looks like a must-try! Thank you! This looks so good! I love small potatoes and whole grain mustard, and the other ingredients are pretty tasty, too! Pingback: Great Ideas -- 20 Healthy Summer Recipes! We will really enjoy your awesome Potato Salad! Thanks so much for sharing this awesome post with us at Full Plate Thursday. Hope you are having a great day and come back soon! This sounds so delicious! Can’t wait to try it. Thanks for linking up with Merry Monday this week; I’ll be featuring your potato salad recipe at our upcoming party. I hope you’ll stop by and link up again! i love yours with all the herbs. Looks absolutely delicioius. I can’t wait to try this salad it looks so delicious! This looks so good and easy to make. i will have to give this one a try. Can we use white potatoes?